A new study found direct evidence of a gender insurance gap, citing the fact that female-led households who rent, are 7% less likely to have renters insurance. The dangers of this gender insurance gap have long term ramifications on the uninsured. An Effective Coverage study found a 7 percent difference in renters insurance coverage by gender. According to a new study completed by ORC International and published by Effective Coverage in March 2016, it was determined that on top of the gender pay gap, American women suffer from a gender insurance gap that puts them at long term risk. While overall the number of Americans with renters insurance is increasing over time, male renters are significantly more likely to have renters insurance than female renters. The study found that 48% of male renters have renters insurance, while only 41% of female renters have a policy. The difference between those two numbers is a gender insurance gap of 7%. The news becomes more concerning when combined with the gender pay gap. Women are likely to make less money, which makes it more difficult for them to recover after an uninsured loss. Additionally, many of these female-led households include children. With children, of course, comes additional personal property that is not insured, making recovery after a fire or theft even more expensive. These female-led households with children also have fewer options for someplace to stay after a loss such as a fire because a hotel is one of the only options. One person can sleep on a friend's couch after a fire, but that's not a viable option when kids are involved. One unfortunately common cause of loss for victims of domestic violence is to have their apartment set on fire by either a former abuser whom they have left or a current abuser with whom they do not live. These apartment fires are devastating when a woman falls into the gender insurance gap, because fire doesn't just take everything in its path. A fire also means smoke and water damage to anything in the home, even if the fire can be stopped. What little a woman has is lost in this situation, and if she is a victim of the gender insurance gap she's starting over from nothing. Regardless of what causes the loss, a woman who is a victim of the gender insurance gap faces more difficulties in rebuilding her life. As women age, the gap becomes more important because a loss can mean delaying retirement or worse. When there is an uninsured loss, there are often no resources to turn to that can replace the things that were lost. This hurts both women and children, and women are less likely to have employers who are understanding of taking time off to handle the loss as well. 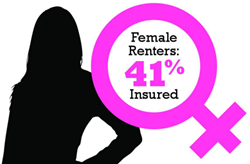 While renters insurance is just one part of protecting women, it's an important part. Closing the gender insurance gap is crucial for victims of domestic violence who have escape, but it's important for everyone because losses happen every day. All it takes is one neighbor who turns away from the stove to answer the phone, or one apartment maintenance employee fixing plumbing with a blowtorch and the entire building can go up in smoke. Effective Coverage believes in education as a core value as well as an important way to help close the gender insurance gap. Renters insurance is now easily available, and it's generally fairly inexpensive. By offering education about the value of renters insurance and the wide variety of unexpected situations to which it can apply. Women can protect themselves for just a few dollars a month in most cases.